This Tau concept art has been kicking around since 2005, but then so have many of the concept sketches for the new Necron units that we're only just beginner to see now. 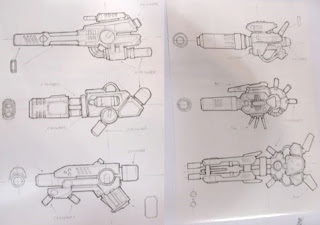 So I thought it would be interesting to look back at a lot of the sketches and ideas from way back to the 4th edition Tau Empire Codex publication and get an idea of what we can expect from the 6th edition Tau Empire army. Now you may remember the Vespid Stingwing sketches which were leaked online for a short time. 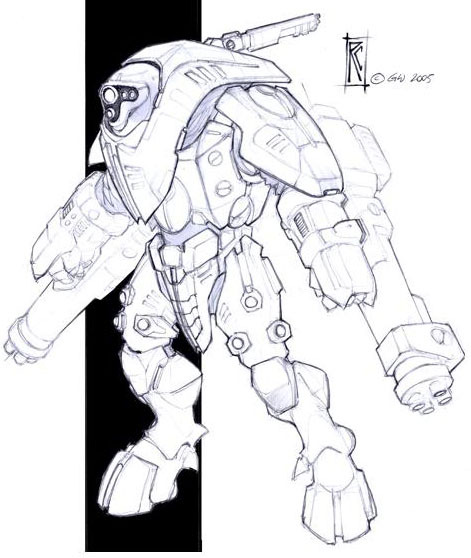 These designs, as well as the new XV25 Stealth Suit and Commander Shadowsun were created by Roberto Cirillo. In fact, elements of his Tau Battlesuit concepts have been used by Forgeworld in the creation of their XV9 Battlesuits and weapons. I've often wondered which kind of direction the general Tau 'style' would be taken in and based on the more recent Forgeworld Battlesuits, I can imagine something far more alien and high tech, moving away from the boxy 80's anime mecha shapes and producing something more sleek and advanced. 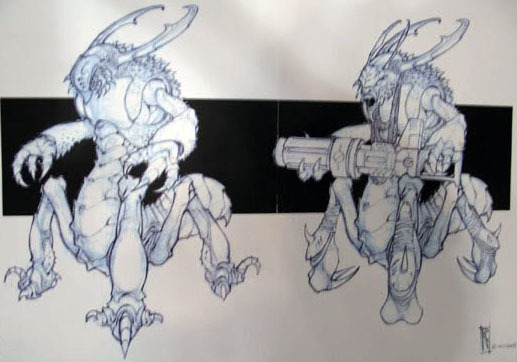 There seem to be almost insect like elements to Cirillo's designs, which would certainly set Tau technology apart from the other armies. It would also unify the overall look and feel of the Tau and any other aliens inducted into the Tau Empire which are also rather insectoid in design. 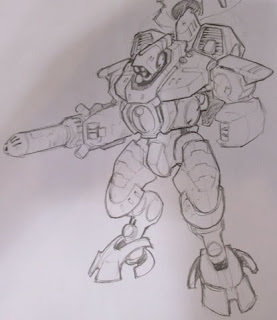 Either way, I'm looking forward to the inclusion of many new Battlesuit types in the new Tau Empire Codex -especially now that Games Workshop are creating all kinds of new weapons and battlefield roles to keep each army as different as possible. 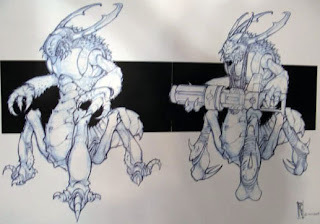 Cirillo came up with all kinds of alien designs from four-armed towering monsters to the Vespid, Centaurs with sci-fi crossbows and even these critters to the left. While it's fun to have these extra units in the Tau Empire army, the focus should always be firmly on the Tau and their highly advanced technology. That is why people play the army and are drawn to the army in the first place. Sure, I'd like a squad of Demiurg as much as the next guy. But only if they fulfil a role in the army that the Tau can't fill themselves. After all, why else would the Tau really want them in their Empire? Necrons received all manner of new and exotic weapons in their new Codex and I expect the new Tau Empire to be exactly the same. Oddly though, it seems that the Necrons got all manner of Strength 5 guns, which were one of the Tau's defining features as an army. They also received all manner of Tesla weaponry to go alongside their Gauss weapons. 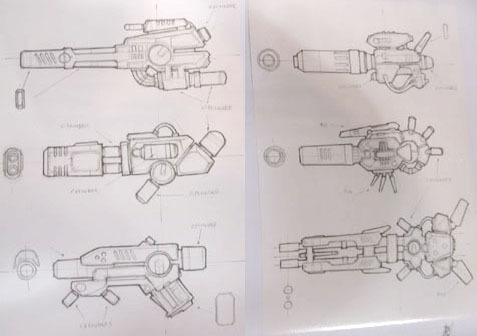 With Tau pulse weaponry being based around plasma technology it will be interesting to see what's in store for the Tau. Especially when railguns and ion cannons are currently rare. Will we see more electromagnet weaponry? I'd bet that we do. Although I can't help thinking I've seen some of these guns in District 9. Personally I'd give anything for my Tau to have the gun that fires a lightning bolt which instantly liquidises a target in a show of red water! Anyway, we'll just have to wait and see what we get. In the meantime I'm going to keep building up my army with units that I believe won't change, like Fire Warriors, Kroot, Stealth Suits and Tau tanks. I actually love the current TAU crisis suits, but the concept art is really welcome, I can wait to have new models, but I have yet to redo my army paint job since the first try didn't worked out as I expected. Just read through, thought you raised some nice point that will get plenty excited. Nice read. Oh and pulse weponary is based on electro rail concepts not plasma. The pulse irself is a super heated particle, forced along an electro field created by two rails in the muzzle, this causes the particle to be fired in a linear direction. Not an advanced concept, the reason that it isn't used though in the real world is the rails can only be used once. Somehow the Tau have managed a method to prevent the corrosion.